Westpac Fiji has released its new banking app. It offers smartphone users a variety of self‑serve banking transactions, meaning they can access their personal accounts to bank whenever and wherever it suits them with an easy to use digital app format. 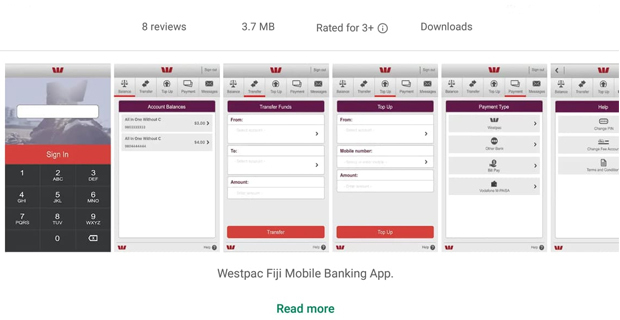 Westpac Fiji Chief Executive Kip Hanna says they have based the design on Westpac Australia’s ‘Westpac Live’ app which won a number of awards when it was released for its simplicity and usability. The Westpac Fiji app can be used on any smartphone or tablet which has an Android operating system. Features of the app that will benefit Westpac’s personal banking customers include unlimited balance enquiries and checking of transaction history via a detailed ministatement that includes transaction descriptions.